As a best practice, we recommend you maintain only one master audience in Mailchimp, and use tags and segments to organize and target your contacts. If you have multiple audiences, you can use our combine audiences tool to merge them together. In this article, you'll learn how use our built-in combine audiences tool. Audience actions are permanent, so we recommend you backup your audiences before you combine them. Keeping a backup is a safeguard and allows you to retain as much data as possible, although some data cannot be exported and will be lost. To learn more about what your backup export will and will not include, check out View or Export Your Contacts. The combine audiences tool doesn’t transfer group or tag data, email engagement metrics such as opens and clicks, member rating, opt-in time stamps, signup source, or GDPR permissions. For this reason, we don’t recommend you combine audiences that are GDPR-enabled. Only subscribed contacts will be moved over to the master audience. After you use an audience for a campaign, you’ll need to wait seven days to combine audiences. To learn more, read Limits on Bulk Actions. 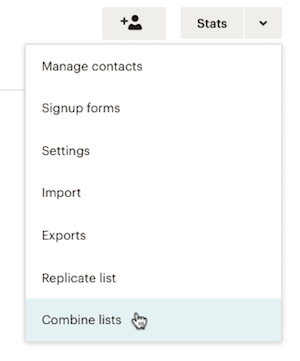 If you’ve created a welcome automation for your master audience, the combine audiences tool will trigger the automation for all contacts moved over from the original audience. To combine audiences without triggering the automation, pause the welcome automation, combine your audiences, then edit the workflow to manually remove the contacts from the old audience. After you've backed up your audiences and exported any data you want to keep, you're ready to merge your audiences. To combine your audiences, follow these steps. Navigate to the list of audiences in your account. Click the drop-down menu next to the audience you want to combine with your master audience, and choose Combine audiences. For example, if you have an audience called "New Alumni," and you want to combine it with a master audience called "Hathaway Alumni," you'll click the drop-down next to your "New Alumni" audience. In the pop-up modal, click the drop-down menu and choose your master audience. If you've set up groups to organize your master audience, check the box next to the group(s) you want to add these contacts to. In the confirmation modal, take a moment to read the data notification and backup your audiences if you haven’t already. Remember that group and tag data, email engagement metrics such as opens and clicks, member rating, opt-in time stamps, signup source, and GDPR permissions will not transfer to the new audience, and that some data cannot be backed up with an export. Data that cannot be backed up with an export will be lost. If you don’t foresee issues with data loss, type CONFIRM and click Combine Audiences. Repeat this process for each of the audiences you want to combine. When you've finished backing up and combining your audiences, you can delete your old audiences. Be sure to update any signup forms to match your new master audience.